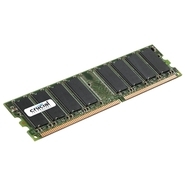 Kingston - 1GB DDR FOR PC 1GB PC3200 DDR 400MHZ 184-PIN 16 CHIPS (64x8) LOW DENSITY STANDARD INDUSTRY(COMPATIBLE OR MONEY BACK GUARANTEED FOR ALL DESK & WORKSTATION).We accept School Goverment & Corporate PO. Same Day Shipping. Samsung - 1GB NOTEBOOK 1GB PC3200 400MHz DDR 200 PIN SODIMM Memory For most Notebook (Toshiba Sony NEC Gateway Dell Dell IBM Acer Hewlett Packard ...We accept School Goverment & Corporate PO). Same Day Shipping. Lenovo - 22P9272 IBM - 1GB PC-3200 400MHZ DIMM 184-PIN CL3 NONECC DDR SDRAM GENUINE IBM MEMORY FOR THINKCENTRE A50 A50P M50 M50E S50 (22P9272). NEW BULK. IN STOCK. SHIP SAME DAY.